Reformed APC (R-APC) is the name of the splinter faction of Nigeria’s ruling party, APC. It has named its leadership at both national and state levels, Premium Times reports. 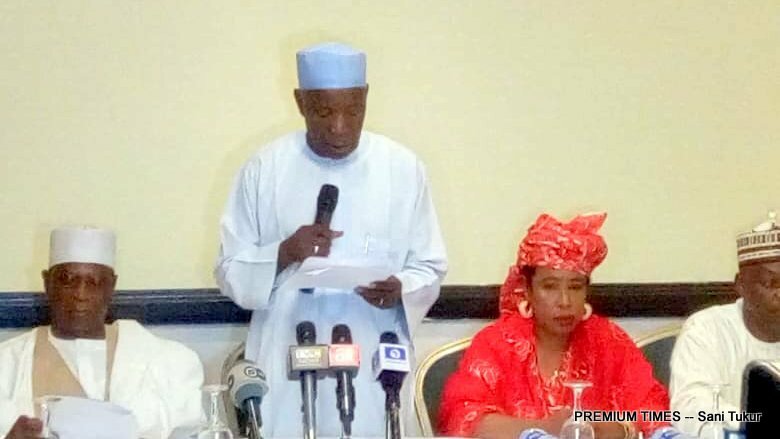 Buba Galadima, who read the text of the press statement, was announced as the national chairman of the faction; while Kassim Afeguba, a spokesman to ex-military ruler, Ibrahim Babangida, is the National Publicity Secretary. 22. Niger State – Dr Theo Sheshi ( Deputy National Organising Secretary. We are here assembled to address you on the state of our party, the APC, the state of the nation and the future of our experiment in constitutional democracy, in Nigeria. 2. You will recall that in the build up to the 2015 General elections, some political parties and groups came together, and formed a brand new political party, the All Progressives Congress, APC. This merger was based on the strong belief that Nigeria had come of age, but was severely underperforming and unable to meet its potentials for good governance. The Nigerian people entrusted power to the APC based on its promises and potentials. 3. We are sad to report that after more than three years of governance, our hopes have been betrayed, our expectations completely dashed. The APC has run a rudderless, inept and incompetent government that has failed to deliver good governance to the Nigerian people. It has rather imposed dictatorship, impunity, abuse of power, complete abdication of constitutional and statutory responsibilities, infidelity to the rule of law and constitutionalism. It has failed to ensure the security and welfare of our people and elevated nepotism to unacceptable height. The APC has failed to deliver on its key promises to the nation. There is no evidence of any political will to reverse the decline of our party, while leaders who have created these circumstances continue to behave as if Nigerians owe our party votes as a matter of right. 4. The APC government, has been a monumental disaster, even worse than the government it replaced. The political party that was a vehicle for enthroning the government was rendered powerless by manipulations and complete lack of due process in its operations. 5. The last straw, was the Congresses and Convention of the APC held recently. The Congresses were intensely disputed as it was conducted with impunity, total disregard for due process, disregard for the party Constitution and naked display of power and practices that have no place in a party we all worked the very hard to put in place. 6. There are countless cases in courts all over the country challenging the legality of congresses and even the National Convention itself. It is very likely that the judicial decisions on these cases will result in massive chaos, confusion and uncertainties. The fate of a party in this state with a few months to the elections is best left to the imagination, but it is not a fate we believe our millions of members should be abandoned to. There were parallel congresses in 24 States namely: Abia, Adamawa, Bauchi, Bayelsa, Benue, Borno, Cross River, Delta, Enugu, Imo, Jigawa, Kaduna, Kano, Katsina, Kebbi, Kogi, Kwara, Lagos, Niger, Ondo, Oyo, Rivers, Sokoto and Zamfara. These congresses in Wards, Local Government Areas and States all over the federation produced different sets of delegates. We therefore had an unfortunate situation where the party has been seriously factionalised and divided in not just 24 States but the 36 States and Abuja FCT. 7. The so-called National Convention of the APC was even worse. The National Convention of the party was ridiculed with constitutional infirmities that were so glaring and obvious that no fair minded person can claim that a legitimate and lawful executive emerged from that process. The Chairman of the organising Committee, Jigawa State Governor, His Excellency, Alhaji Mohammed Badaru Abubakar, declared 18 seats unopposed and uncontested, since only one valid candidate stood at the end of the grossly manipulated nomination exercise for each of the offices. He therefore proceeded to declare them duly elected in flagrant abuse and violence to the Constitution of the APC. Article 20 (1) of the APC Constitution states “Unless otherwise provided for: All party posts prescribed or implied by this Constitution shall be filled by democratically conducted elections at the respective National Convention or Congress subject, where possible, to consensus, Provided that where a Candidate has emerged by consensus for an elective position, a vote of “Yes” or “No” by ballot or voice shall be called, to ensure that it was not an imposition which could breed discontent and crisis”. We all witnessed on live television and at the venue, Eagles Square Abuja, that the Convention Chairman, only put the “Yes” question to all the delegates, using words to the effect: Do you affirm? Do you agree? There was no opportunity whatsoever given to the delegates to say whether they are voting “No” for any candidate as the “No” question was never put to them. 8. Even before these illegal exercises that have alienated millions of members, there has been widespread disenchantment with the manner the party has been run, and the conduct and performance of our governments. The nPDP, a group that has made a major contribution to the emergence of the APC administration has made strenuous efforts to invite attention to inequities, injustice and poor management in our party without any success.The nPDP had shown good faith and commitment to the party, but it has been rewarded with indifference and even contempt.It is obvious that the leadership of the APC has decided to shut out members of the APC, as well as other members who have raised genuine grievances and a desire to improve the responsiveness of the APC to the desire of members for a party founded on democratic principles. 9. Under the circumstances, patriotic elements and most of the original founders of the APC have found themselves in the opposing side of this charade. Most of the delegates who bought and paid for forms for the congresses and convention and were elected as delegates have come together to take control and give legitimacy to APC to be now known as and called REFORMED-APC (R-APC). The R-APC as constituted have officers in all the wards, 774 Local Governments, and all the 36 States of the Federation including the FCT. The R-APC also have National Executive Committee, the National Working Committee and other organs of the Party are properly constituted and functional. The R-APC includes all the progressive forces in APC, including most of the leading members of the defunct nPDP, CPC, ANPP, ACN and others. 13. We call on all Nigerians, not to despair as a rescue plan is in the works and will be unfolded soon. 14. I thank you all for listening.